Lately I have been loving Barolo in Seattle. 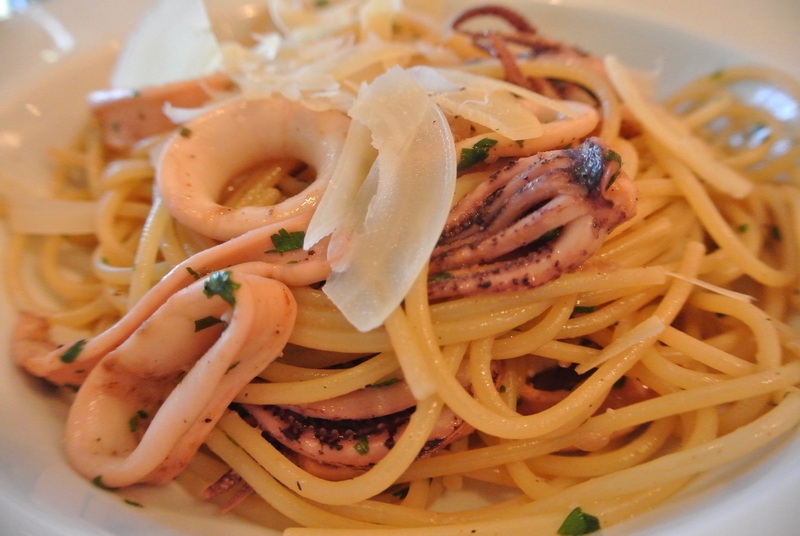 I went late night a couple weeks ago with some people from our building and just fell in love with their Calamari Pasta…a light, cooked to perfection pasta dish. I have been back about 6x since. In addition to our 365 wine challenge we have been trying to learn pairing the wines we are drinking with food. I thought I would attempt a take on the Calamari Pasta. After work, I walked over to Whole Foods South Lake Union to pick up some calamari from my fish monger Devon. I like the price of the squid rings/ tentacles at about $7 a pound its cheaper than all other sea foods (even though sockeye is in season now). Add shaved Parmesan reggiano to the dish. I boiled some salted water for the pasta (I chose spaghetti). Meanwhile…in a pan on another burner…. I heated up olive oil. I finely minced both 3 cloves of garlic and 1 shallot. Once the oil was hot I threw the garlic and shallot in the pan. PSSSSSSSSSSSST…with whispers of smoke. I cooked for about 1 minute then added the calamari followed by a healthy pat of butter and a couple squeezes of fresh lemon juice and heavier pinches of salt and pepper. 1 minute later I added freshly chopped cilantro and let cook for another 20 seconds. Finally I tossed with the pasta cooked al dente. This dish is great! Still not restaurant quality but definitely awesome! ***Timing is everything on this dish. Note the calamari only takes about 2 minutes to cook. So make sure the pasta is basically ready/ al dente in the pot already strained and ready. Since the calamari from the pan is the sauce, be ready to toss together at the same time. Add more pepper to make spicier.